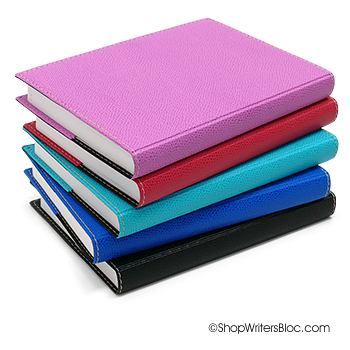 Exacompta Pocket Journals are adorable yet sophisticated notebooks for your purse, pocket, briefcase or backpack. 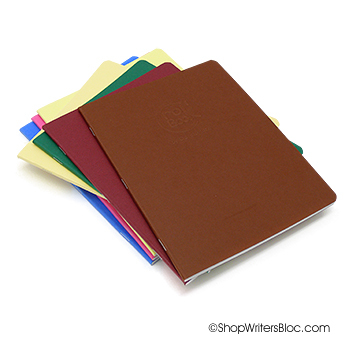 They are the perfect size for journaling on the go or while traveling. 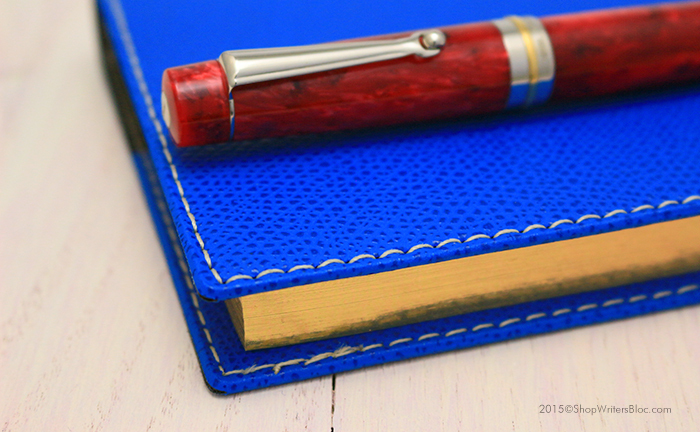 The gold-colored page edges of the pocket journal add a touch of class to the high quality paper it contains. 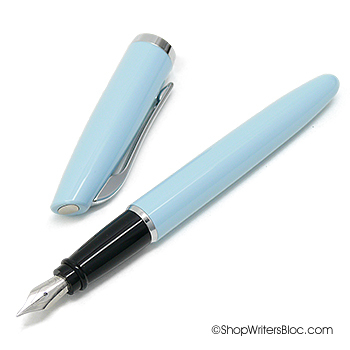 The paper is made in France by Clairefontaine and has the exceptionally smooth finish that is the hallmark of their writing paper. 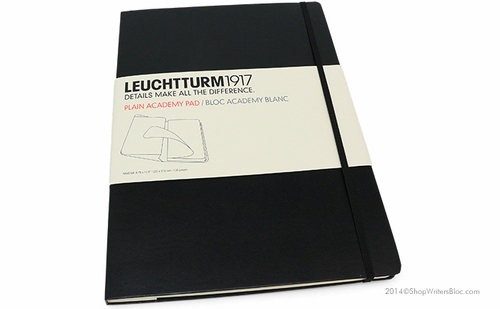 Even though the journal is only 1/2″ thick, it contains 192 sheets of lined ivory paper. The lines are light grey, are spaced 7 mm apart and do not go all the way to the edge of the page. 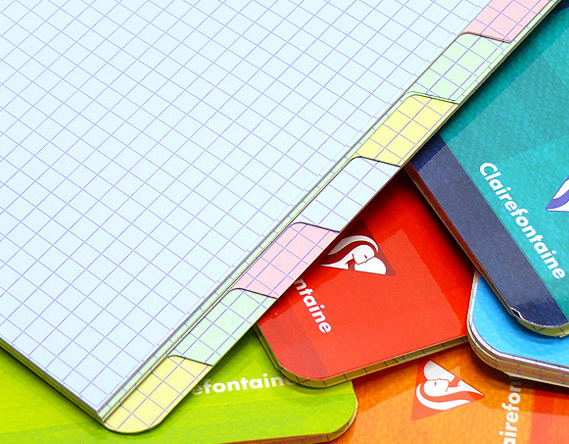 To fit so many pages into such a compact size, Exacompta has used a light-weight yet strong 55 g paper. 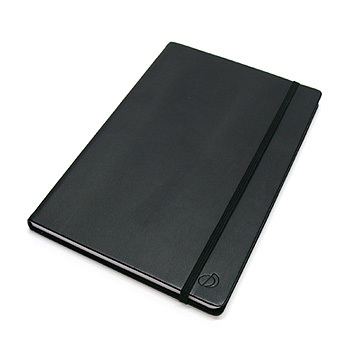 The journal insert is covered in a flexible, textured. light brown colored cardboard. 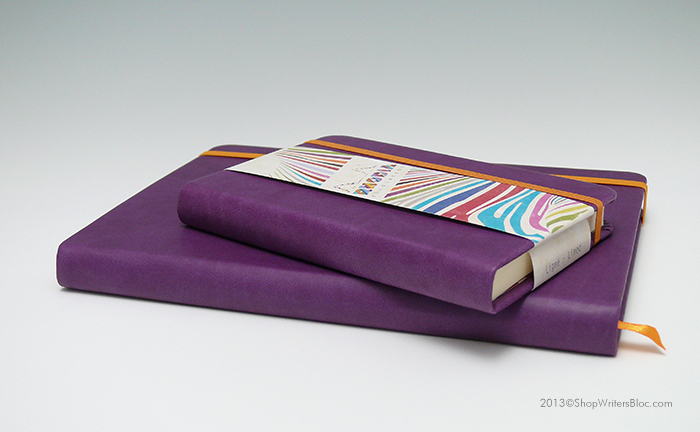 The sewn binding enables you to open it without fear of the pages coming loose and falling out. Each page is perforated in the lower right corner so if you tear off the corners as you go, you can easily open to the current unused page. 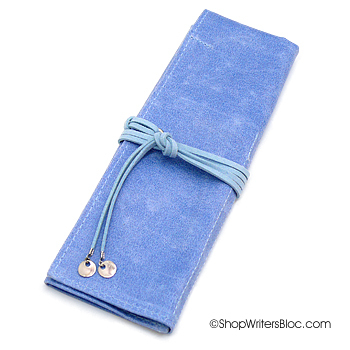 The ribbon bookmark is glued to the outside of the top of the spine which is okay because even though you can use the insert on its own, the journal is usually paired with a stylish refillable cover. 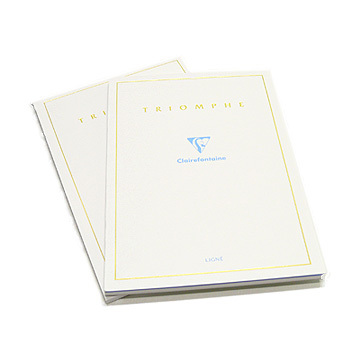 Without the cover, the insert is about 3.5″ x 5″, with the cover it is about 4″ x 5.5″ in size. Three styles of refillable covers are available for the Exacompta Pocket Journal: Club, Soho and Mignon full calf leather. All of them are stitched around the edges and when taken care of can last for many years. The refillable covers have pockets on the inside that the cardboard cover of the journal refill slides into. 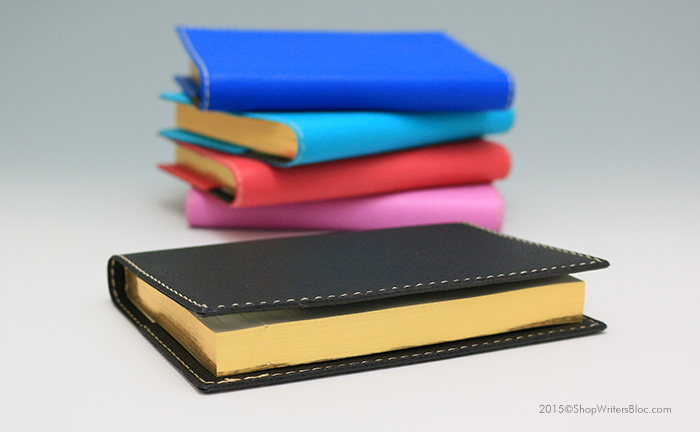 The Club and Soho covers are both made of a sturdy leatherette, the difference being that the Club cover is textured/grained and the Soho cover is smooth. 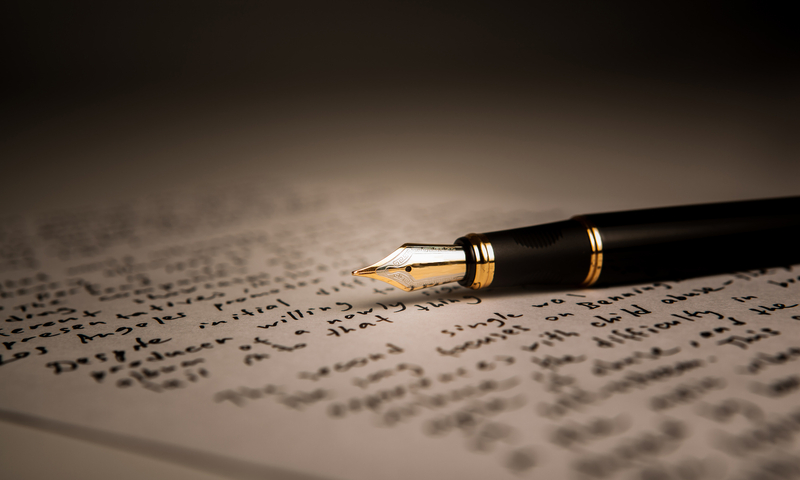 From my own personal experience, if you want to use both sides of each page, I would recommend writing with fine tip gel pens, ballpoint pens or pencil. Fountain pen ink tends to bleed through this light-weight paper. 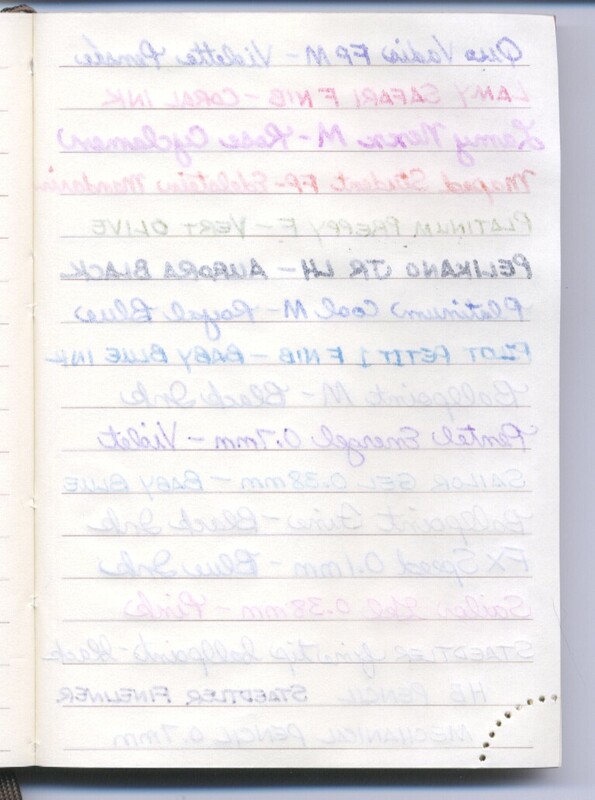 Medium and broad tip gel pens tended to bleed through the paper as well. Check out the scan of the writing test below and see what you think. 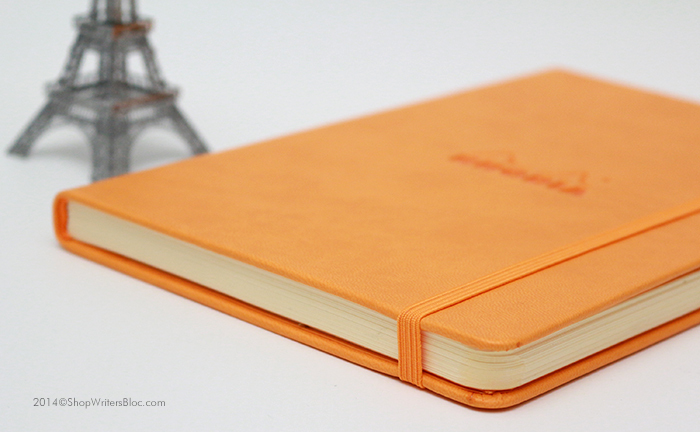 Do you carry a journal with you when you travel? 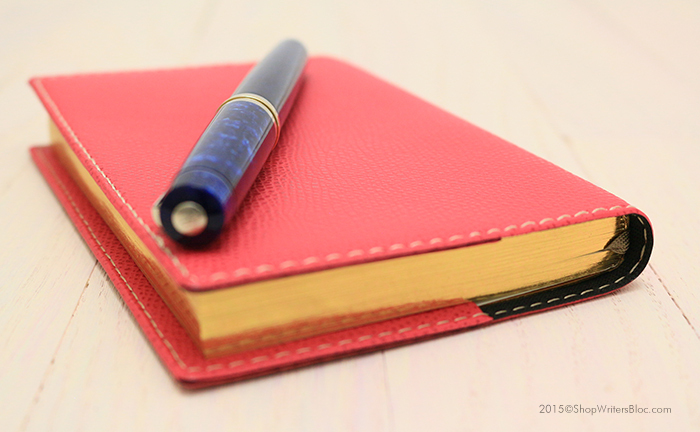 What are your favorite pocket-size journals? 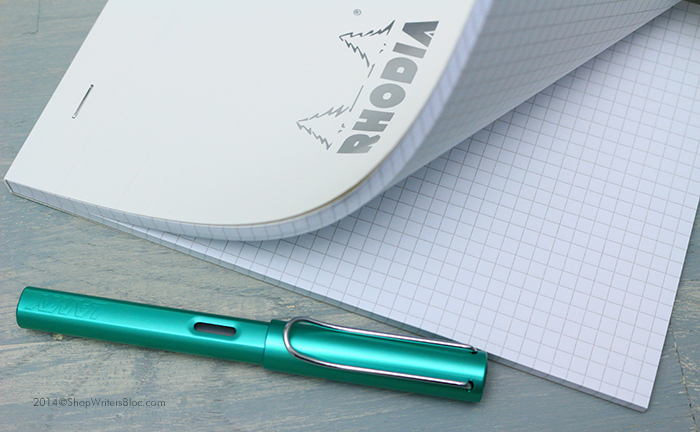 If you find this color to be inspiring and would like to add this color family to your daily arsenal of paper, journals, ink and writing instruments we have some suggestions for you. 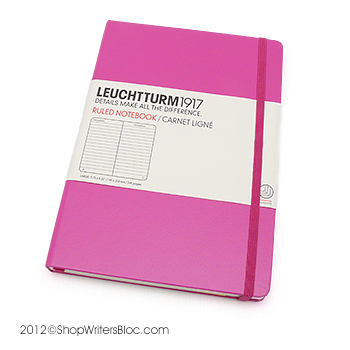 The sturdy leatherette Lilac Club cover on this Exacompta journal can be refilled over and over again with 190 sheet refills in graph, blank or undated 365/lined paper. 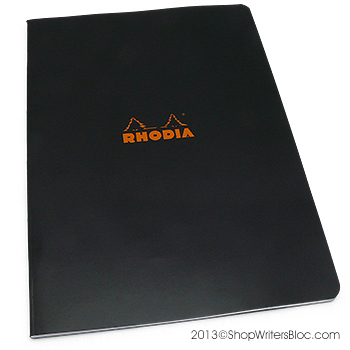 Rhodia’s Webnotebook contains some of the best quality paper you’ll ever find, plus you can get it with a purple Italian leatherette cover. Available in both A5 and A6 sizes. 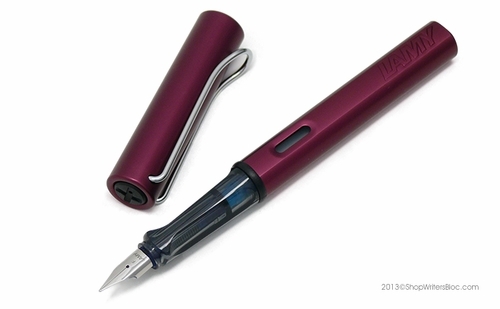 The LAMY Al-Star purple aluminum fountain pen is a very deep, dark shade of purple-pink – we might even call it Midnight Orchid. 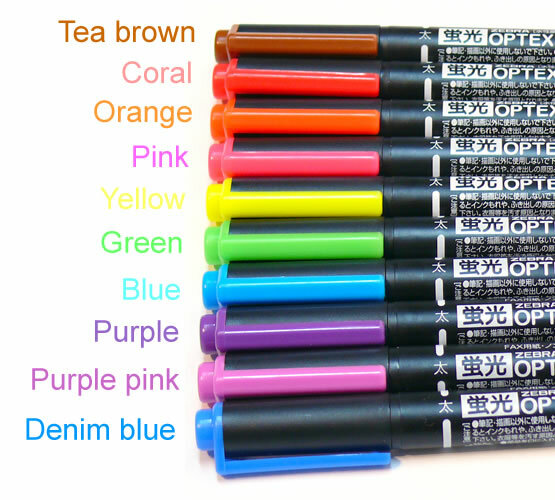 We were excited to discover that Zebra Optex highlighters include a Radiant Orchid shade of purple-pink! 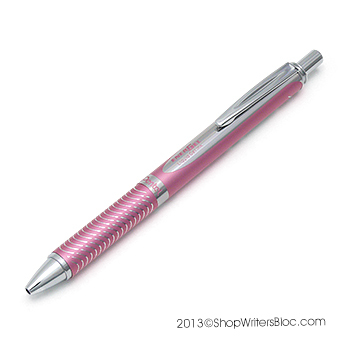 The Pentel Energel Metallic Pink Gel Pen is made from a long-lasting aluminum alloy and can be refilled with a great shade of Violet Energel ink (refills purchased separately). 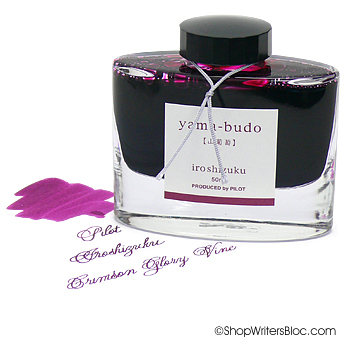 This is our biggest temptation when it comes to Radiant Orchid shades of ink – Pilot Iroshizuku Fountain Pen Ink in Crimson Glory Vine (or yama-budo). Such a beautiful glass bottle too! 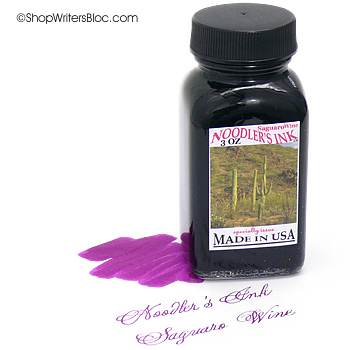 Noodler’s has such a huge variety of fountain pen ink we’re not surprised to find this Radiant Orchid shade of Saguaro Wine. It’s made in America too. 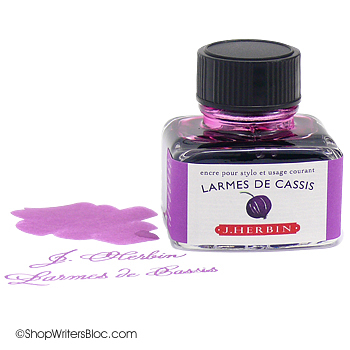 The name Larmes de Cassis means “Tears of Blackcurrant” and according to J. Herbin it is the symbol of grievance and penitence (Tears). 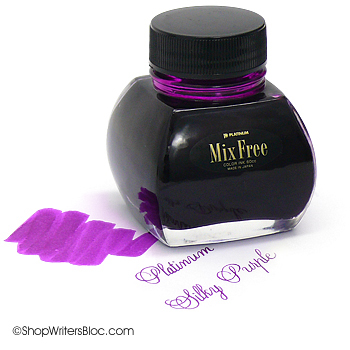 Platinum’s Silky Purple Mix-Free fountain pen ink can safely be combined with other Mix-Free inks to create custom shades of fountain pen ink. 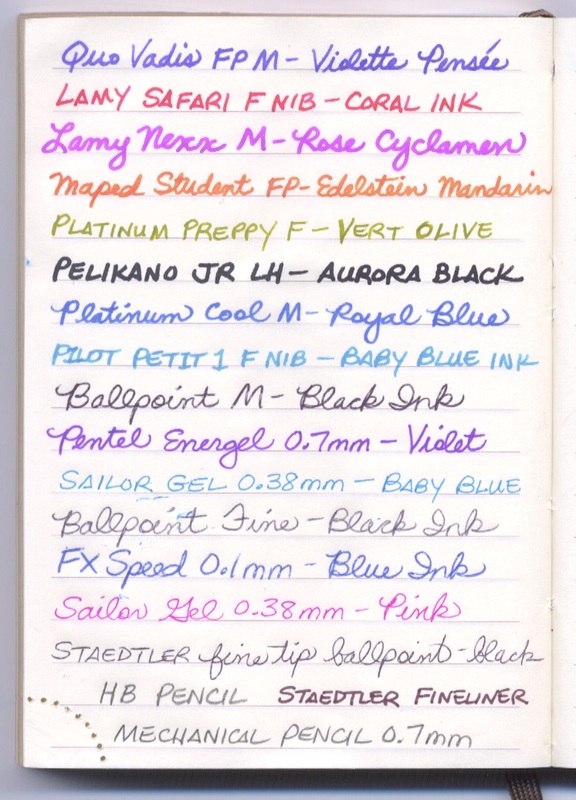 We like the Radiant Orchid purple-pink shade of this ink just the way it is! These are just a few paper, pen and ink supplies that can add more Radiant Orchid purple-pink to your home or office desk. 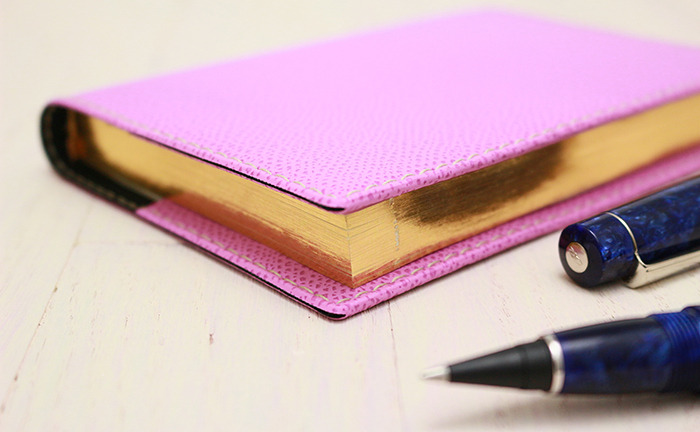 What Radiant Orchid stationery supplies do you find inspiring? New affordable and refillable Texas covers from Quo Vadis and Exacompta Prestige are available for both 2012/2013 academic planners and 2013 appointment books. These covers are available for at least 30 different planner formats, so we were excited to finally see them in person. Texas covers are made from an incredibly soft, velvety suede-like material. 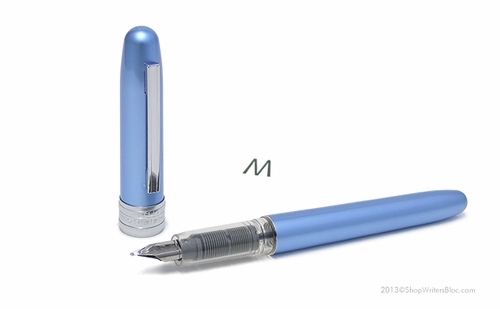 They have a matte finish and are available in 5 lightly-marbled colors this year: vibrant shades of blue, red or bamboo green, muted violet purple and classic charcoal grey. The front of these covers has a matching decorative area that I would suspect is designed to mimic the appearance of a strap closure on a leather journal. The Texas cover is very flexible, compact and light-weight. 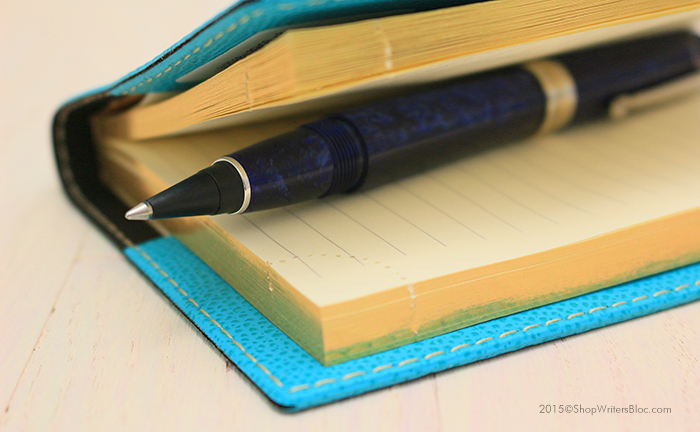 Since it is refillable, inside both the front and back cover there are pockets that the cover of your planner refill can slide into. The edges of the Texas covers are not saddle stitched like Quo Vadis’ Club and Soho covers. Rather, the edges of the Texas cover are embossed to look as if there is stitching. Since these covers are new this year, their durability has yet to be seen. We would guess that the Club and Soho covers are made to last longer, but those covers are also more expensive. With our present struggling economy, the Texas cover is a colorful new option that can save you a few dollars. 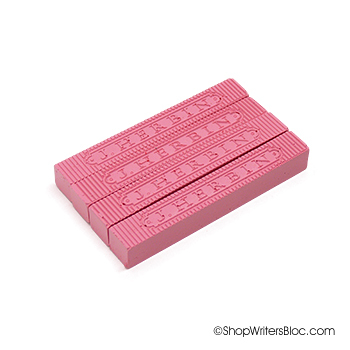 Do you like to use Quo Vadis or Exacompta date books with refillable covers? 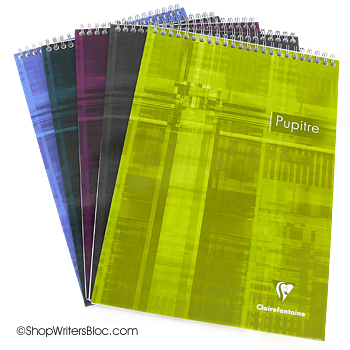 What’s your favorite cover and planner format?